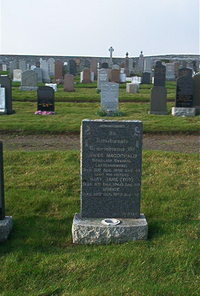 James Macdonald Bunillidh Smerral Latheronwheel died 31st August 1938 aged 33. Sister Mary Jane Macdonald (Tot) died 8th December 1960 aged 60. Sister Minnie Macdonald died 29th December 1973 aged 72.